DMAC Security has provided top-quality security services within the Baltimore-Columbia-Towson areas for over 30 years. Our approach to security guard training and staffing emphasizes professionalism, reliability and communication. All of our guards, whether armed, uniformed, or otherwise, are equipped to deter and subdue threats while maintaining a peaceful environment ideal for any commercial or residential area. The main purpose of security is to deter threats and prevent incidents of theft, sabotage, property damage, or violence. As such, while our security guards are trained to handle dangerous situations, they are also trained to prevent them from occurring in the first place. When a client hires security guards through us, we take time to understand their circumstances and provide personnel that fit their needs. Our guards are trained to integrate with the communities they’re assigned to, whether it be a large commercial establishment or a personal security detail. They adapt to the processes and routines of their assigned clients when needed, can carry out other professional functions. This is on top of the training they receive from Maryland State Police certified firearms instructors and the supervision of an experienced management team. Our security guard services include armed security, doorman/concierge security, uniformed security, executive/VIP protection, and contract security. All of these can be supplemented with our range of security systems and installations. A good security service doesn’t just prevent incidents, it actively promotes and preserves the peace of its environment. This means that any security personnel assigned on duty should be able to mix well with their client institution while maintaining professional decorum. These considerations can help in determining the ideal personnel setup for any particular security detail. For example, many commercial establishments need guards who are approachable to keep customers at ease. Meanwhile, business owners and executives may need guards with the proper attire and decorum for business functions and social gatherings. Before hiring or contracting your security guards, we make sure to assess your context and your requirements properly. Our trained supervisors will provide suggestions on how to get the right guards for the job while acknowledging your constraints and preferences. 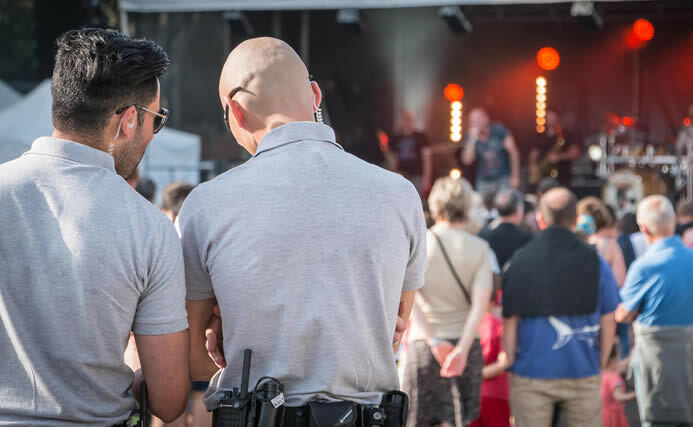 On top of standard perimeter patrol, crowd control, and threat deterrence, here are some specific services to consider for your security guards. The presence of armed guards is an especially effective deterrent against would-be offenders. As such, it’s often employed at establishments with highly valuable assets, such as museums, jewelers, and financial institutions; or for events with a large number of people, such as concerts, conferences, exhibitions and parties. Protecting people and property. Armed guards are especially effective at deterring or dispersing vandals, burglars, and assailants. Enforcing access protocol. This is especially important for areas housing cash, valuables, or critical data. Avert threats. Our armed guards receive training directed specifically at identifying threats and stopping them before they can escalate. Doorman and concierge security guards are concerned with monitoring foot traffic and enforcing access restrictions. On top of this, however, they typically have to be able to provide guests with basic services and information. For this reason, they are usually employed in residential complexes or establishments whose business is more particular with privacy and confidentiality. Maintain access protocol. They ensure that guests or customers can get where they need to go while staying out of places they shouldn’t be in. Handle packages and mail. They are trained enough to spot suspicious packages and prevent them from reaching the residents or guests. Tackle emergency situations. They are well-versed in providing emergency help to residents, staff and guests when the need arises. All our uniformed officers are professionally trained, competent personnel, and armed security guards go through extensive firearms training. We also offer a blazer and tie option where uniformed officers may be inappropriate. We also provide contract security services to clients who choose not to employ an in-house security team. Contract security guards that we provide go through similarly rigorous background checks and training before being assigned to their posts. The specific team composition and training are determined by our supervisory teams based on their assessments of a client’s needs. This allows our clients to focus on what they do best, while we handle what we do best. With over 30 years in the industry, we are committed to providing all our clients with comprehensive security solutions. When you hire security guards from DMAC, you get years of experience that are applied to optimizing your security setup upon engagement, and continuously improving it as our work with you continues. We also offer special rates for long-term utilization of our service. Ensure that you get the security personnel you need. Get in touch with us to discuss the ideal security team composition, training, and equipment for your establishment, event, or group. We provide free, no-obligation consultations and quotes.